How many people have heard of or been to La Buca? If you haven’t yet made your way run, don’t walk, as soon as humanly possible. 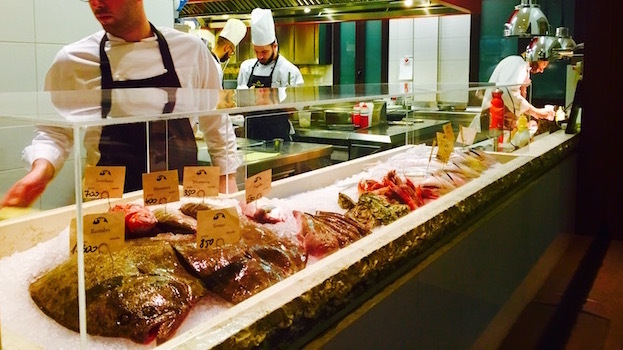 Simply put, La Buca is easily one of Italy’s best seafood restaurants. 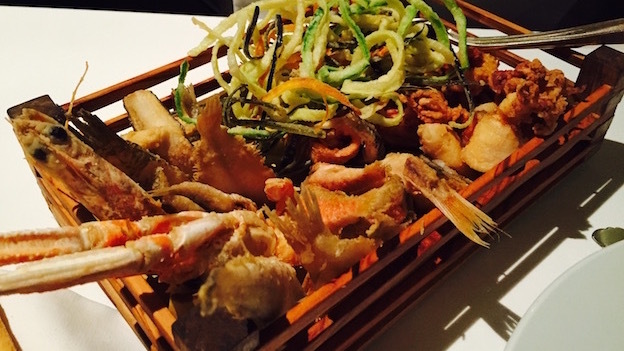 A family-run operation, La Buca is the brainchild of Stefano Bartolini, the calm, soft-spoken but clearly self-assured owner, who has built a seafood empire that includes three Osteria del Gran Fritto bistros in Cesenatico (next door to La Buca), Milano Marittima and Bologna. La Buca was founded in 1985 and is located in the Porto Canale di Leonardo Da Vinci, which is the prettiest part of the seaside town of Cesenatico in Emilia-Romagna. Along with Rimini and Riccione, Cesenatico is part of the triangle at the heart of Italy’s summer beach movida, in which youngish beachgoers from all over Europe gather and party relentlessly. 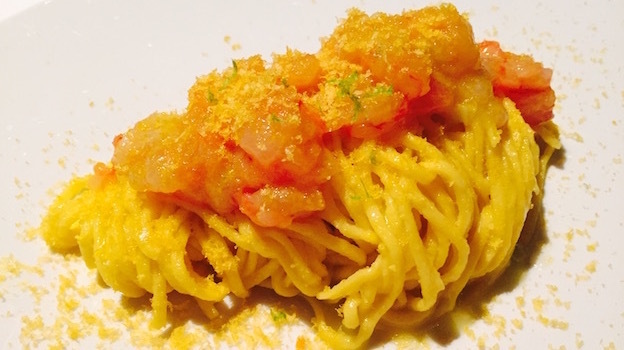 As a young man, Bartolini worked in his mother’s Pensione Stella Marina and then in his father’s Marcello restaurant. Despite having briefly dedicated himself early on to obtaining a business degree, Bartolini’s roots were such that seafood came naturally to him, so he quickly turned back to his first love. 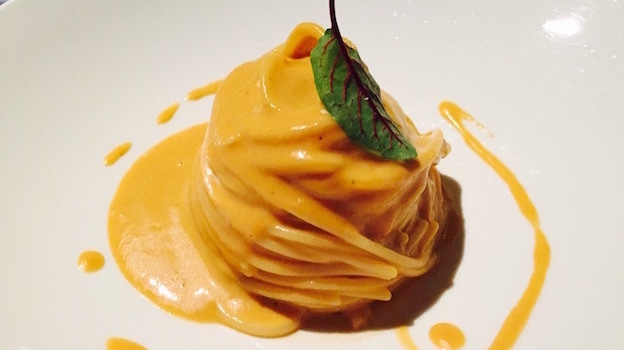 La Buca is a one Michelin star restaurant that is actually much closer to one and a half, if such a thing might exist. The pretty interior design, rather minimalist but warm and functional, is all earth-tone colors, metal, glass and essential lines. It is the work of Stefano’s son Andrea, an architect and admitted Champagne nut. Tables are set far apart and seats are very comfortable. Near the open kitchen towards the back, a refrigerated glass case allows you to see the available fish, crustaceans and mollusks, all on display. Chef Gregorio Grippo has been with Bartolini since 1986 and that sort of continuity shows, with one very precise dish after another emerging quickly and efficiently from the kitchen. 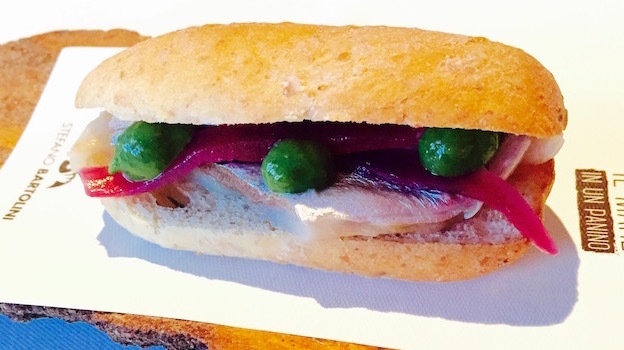 The amuse-bouche, a mackerel, candied onion and Italian chicory cream sandwich is briny and fresh, immediately setting off images of walks and of gardens by the seashore. The fritto is exceptionally airy and light, with absolutely no hint of grease whatsoever; while the two pastas, both archetypes of their respective recipes, are not to be missed. 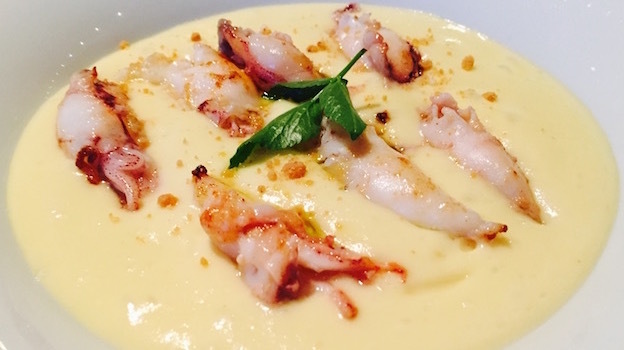 If anything, it is the small squid and potato foam dish that almost prove too much of a good thing: the squid and the potatoes are tasty and flavorful, but the potato foam is really more of a heavy cream. It is an outstanding dish, but perhaps too hearty and rich for an appetizer. The wine list at La Buca is exceptional and fairly priced. I don’t believe there are five other places in Italy that have a selection of half bottles comparable in quality to that of La Buca. This is not unimportant for those of us who are always travelling and often eat alone. Clearly, we all relish the opportunity to pick from a large pool of high-level 375 mL bottles. Read’em and weep: half bottles from San Michele Appiano, Gaja, San Guido (that’s right, half bottles of Sassicaia), Fèvre, Domaine Weinbach, Alphonse Mellot, Krug, Philipponat, Ruinart, Gosset. I could go on. Moving on to the 750 mL bottles, if you like Champagne and bubblies in general, you’ve come to the right place. Andrea Bartolini’s love for all things bubbly shows in the selection of fifteen different Italian sparklers and more than forty Champagnes, including some hard to find gems. If that wasn’t enough, you have two pages dedicated to Krug and Dom Pérignon verticals. Still wines are sourced from many of Italy’s best wineries including numerous selections that have been clearly chosen with care. Looking for Bartolo Mascarello, Terlano, Valentini, and Gravner? No problem. Diners will also find bottles from Leone Conti, Santa Lucia, La Tosa, Kofererhof, Falkenstein, Tiberio, Borgo Paglianetto and many more under the radar properties. High quality foreign estates are also well represented, from Prager to Leroy, with a smattering of old vintages that provide even more temptation. I can’t say enough what a pleasure it is to walk into a restaurant where an obvious love for wine shines brightly, as opposed to so many other places where the lists are copycat, boring and replete only with the usual names anybody can think of. In fact, if the food at La Buca weren’t so great, I’d still come here just to drink the wines! On this night, I keep things simple. 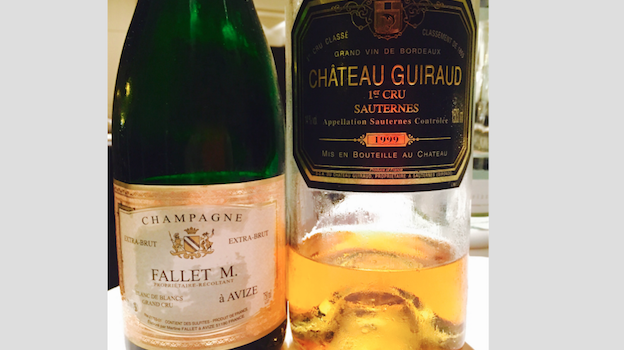 The outstanding NV Fallet M. Champagne Blanc de Blancs Extra Brut Avize Grand Cru and the 1999 Château Guiraud Sauternes Premier Grand Cru Classé are just what the doctor ordered at the end of a long hard day of work in the countryside. The former is a little known, very traditional Champagne house of Avize; it produces one of my favorite Blanc de Blancs (aged upwards for six years on the lees), flavorful and concentrated but light on its feet (the same wine may be confusingly sold under the labels of Fallet-Prévostat and Fallet-Gourron). And Guiraud is a fail-safe choice, as there are fewer people anywhere who know more about Sauternes than technical director and part owner Xavier Planty. The 1999 is redolent in aromas and flavors of orange zest, caramel and honeyed tropical fruit. It comes through rich and creamy. Both wines accompany me effortlessly and well through a magical night of food and wine.